If a woman was not able to have a child, it was often thought that it was because God was punishing her for some sin. But we see here that this was not the case. Zacharias and Elizabeth were blameless before God. They were not being punished. It took sometime time before they got a child. Zacharias felt it was even too late. And then he tries to give God a lesson in biology and procreation. ”How can I believe this? I am an old man and my wife is elderly, too.” He questions the message from the angel. What is clear wasn‘t because God didn’t hear their prayers. It wasn‘t because they were sinning and so God wasn‘t answering their prayers. It was because God had something in store for them beyond anything they could ask or imagine. They would become the parents of John the Baptist who would prepare the way for Jesus Christ. They had waited and waited and waited, and God had finally answered, in His own time, and in His own amazing way! God always keeps his promises. He kept his promises to Israel. 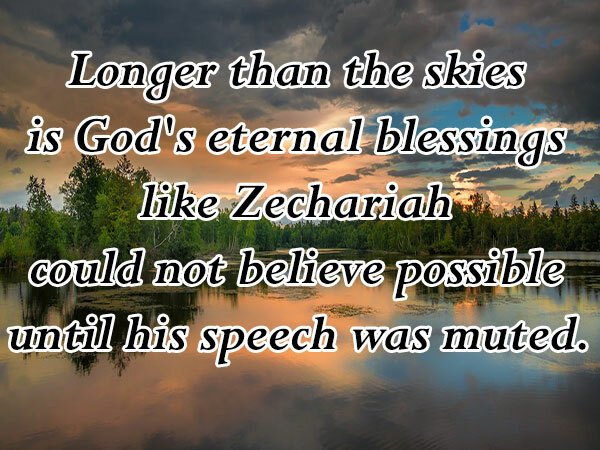 He kept his promises to Zacharias. And He will keep His promises to you. In causing Elizabeth to become pregnant in her old age, we read at the end of Luke 1:25 that God took away her reproach. God removed her shame of barrenness. One of the greatest promises in the Bible which God has given to each of us is that, like Elizabeth, He will take away our reproach and our greatest shame.